Heavy-duty construction for top of the line performance. Perfect for protecting domestic meats, game, fish, vegetables or your personal possessions like silver and valuable documents. 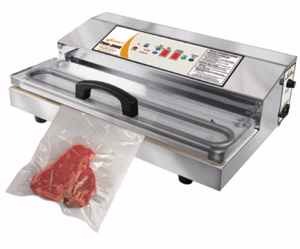 Commercial grade vacuum sealer with extra large seal bar for sealing bags up to 15" wide. Double piston vacuum-pump delivers 28" HG vacuum strength with 935 watts of power (120 V, 60 Hz). Easy to use, bright digital readout allows full control over vacuum process. Adjustable seal time to control seal on any bag thickness. See-through acrylic vacuum lid for the perfect bag alignment. Detachable power cord with storage compartment. Keep air out and seal freshness in! This home vacuum-packaging system prevents freezer burn and keeps foods fresh and delicious up to five or six times longer than conventional storage methods. The countertop appliance not only keeps food fresh longer, it also helps save money--no more throwing away freezer-burned meat, moldy produce, or forgotten leftovers. Choose from two modes of operation: automatic mode for vacuuming and sealing with a simple touch of the button, or manual mode for customizing and controlling the amount of vacuum pressure desired. Bright LED lights make it easy to monitor the stages of the sealing process at a glance. The easy-to-use appliance also comes equipped with an extra-large Teflon bar for sealing bags up to 17" inches wide, a double-piston vacuum pump, and a transparent vacuum lid for perfect bag alignment while sealing. Other features include a fan-cooled motor, commercial-grade acrylic construction for long-lasting durability, a detachable power cord, and a handy cord-storage compartment. 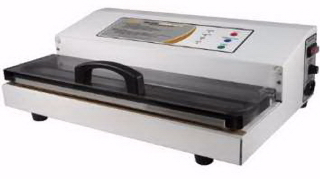 A nice addition to any busy kitchen, the vacuum sealer measures 22-1/2" by 12-1/4" by 6". This is the repair kit for Item #644-106 & 644-100 vacuum sealers. 1-(10mm) Teflon tape for the vacuum sealer lid. 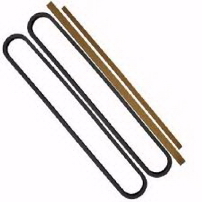 Single heat replacement sealer strip for Item #644-106 & #644-100 vacuum sealers. Measures 17" long. These pre-cut vacuum bags will save you money and storage space while keeping your food and game fresh up to 5 times longer. These bags are ideal for a single chicken breast portion or hunks of cheese. BPA-free and FDA approved for food storage. Now featuring dispenser boxes to help you stay organized. Ideal for hundreds of uses. 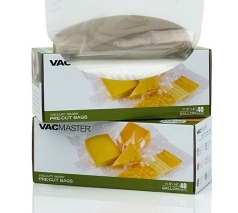 Full mesh quart sized vacuum sealing bags - 8" x 12". 3-mil thick material provides optimum freshness. Eliminates freezer burn and food dehydration. Bags can be frozen, refrigerated, boiled or microwaved. Bags are suitable for sous vide cooking. Compatible with all brands of vacuum sealers. These pre-cut vacuum bags will save you money and storage space while keeping your food and game fresh up to 5 times longer. These bags are 1-1/2" wide x 14" long equivalent to a gallon. This makes these bags ideal for sealing up pre-made meals for the family. BPA-free and FDA approved for food storage. Now featuring dispenser boxes to help you stay organized. Ideal for hundreds of uses. Full mesh gallon sized vacuum sealing bags 11.5" x 14". 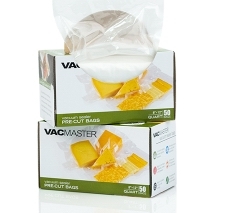 These pre-cut vacuum bags will save you money and storage space while keeping your food and game fresh up to 5 times longer. These bags are 15" wide x 18" long which makes these ideal for sealing up pre-made meals or sealing leftovers for the family. BPA-free and FDA approved for food storage. Now featuring dispenser boxes to help you stay organized. Ideal for hundreds of uses. 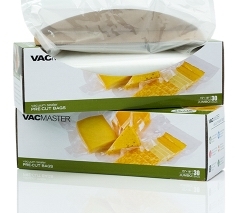 Includes: 30 per box - full mesh jumbo sized vacuum sealing bags 15" x 18". Non-Commercial Style Bags Found Below. These bags have a textured surface inside that allow them to be used with the above Weston machine, Food Saver, Black and Decker and other machines that do not enclose the entire bag inside a chamber. 100 count 6" x 10" vacuum sealer bags that are designed for #644100 and #645413 but will work with most leading brand vacuum sealers, such as Food Saver, Black and Decker and Deni as well as the FMA and the automatic machine above. 100 count 11" x 16" vacuum sealer bags that are designed for #644100 and #645413 but will work with most leading brand vacuum sealers, such as Food Saver, Black and Decker and Deni as well as the FMA and the automatic machine above. 100 count 8" x 12" vacuum sealer bags that are designed for #644100 and #645413 but will work with most leading brand vacuum sealers, such as Food Saver, Black and Decker and Deni as well as the FMA and the automatic machine above. Vacuum Sealer Bag Roll 8" x 50'. 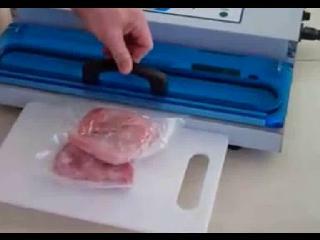 Vacuum sealer bags that are designed for #644100 and #645413 but will work with most leading brand vacuum sealers, such as Food Saver, Black and Decker and Deni as well as the FMA and the automatic machine above. Make the bag as long as you want! Vacuum Bag Roll 11" x 50'. Stainless steel construction. Makes vacuum sealing easier by having your product prepped and you can just simply add it to the pouch with no fuss or mess. Specifically designed to accommodate 12" wide gallon pouches, this useful tool allows you to fill your pouch while keeping the sealing area clean. If working with liquids such as soups or marinades, this stand helps guarantee a reliable seal every time.